Continuing the “Fruity Pebbles” theme, LeBron James debuted a “Multicolor” Nike LeBron 15 as a nod to his favorite cereal. This “Fruity Pebbles’ iteration of the Nike LeBron 15 sports a full Multicolor upper paired with White detailing to represent milk poured on the tongues, laces, sock-liner, pull tabs and midsole. Finishing off the theme is an icy translucent outsole. 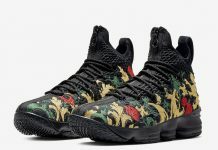 Look for the Nike LeBron 15 “Fruity Pebbles” to release on March 30th at select Nike Basketball retailers. The retail price tag is set at $185 USD. Take an on-foot look at the cereal-inspired LeBron 15 below and let us know what you guys think in the comments section.